Imagine if doctors could prescribe video games for severe pain instead of painkilling narcotics. 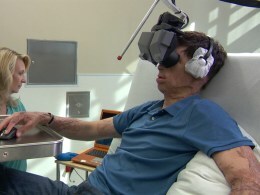 Rock Center’s Natalie Morales meets a burn patient whose success story using virtual reality is described as nothing short of miraculous. After an IED attack in Afghanistan in 2008, Lt. Sam Brown says playing a virtual reality game has helped manage his pain better than taking morphine.